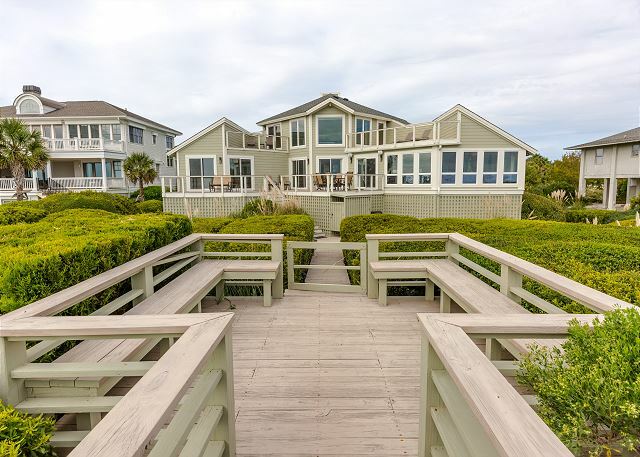 This is the absolute BEST OCEANFRONT home for vacation rental on Seabrook Island. The entire upstairs is a luxurious master suite with huge picture windows capturing the panoramic ocean views. 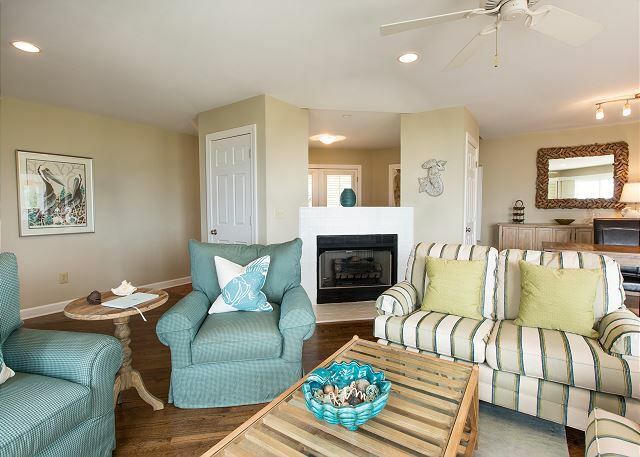 You may sun on your private deck and then enter the master bath for a spa like experience! 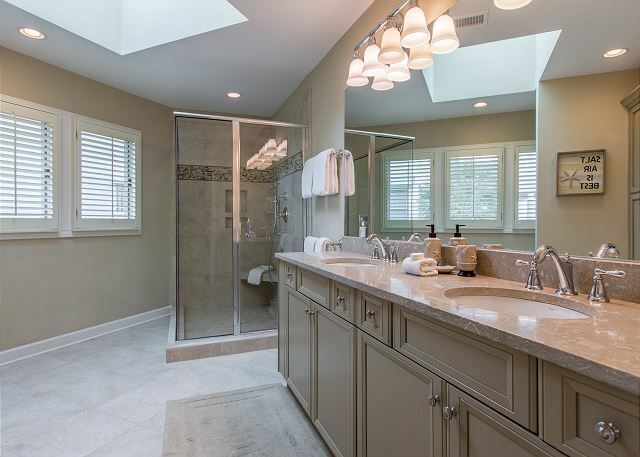 The large tub is a great place to relax for a long soak after a great round of golf! 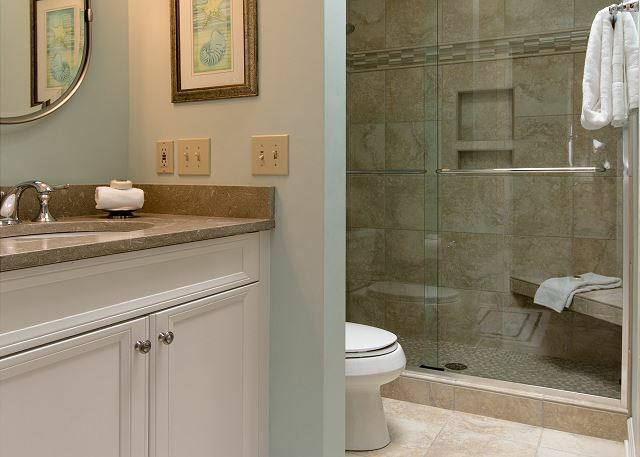 Enjoy a cool shower following a spirited tennis match or day at the beach. 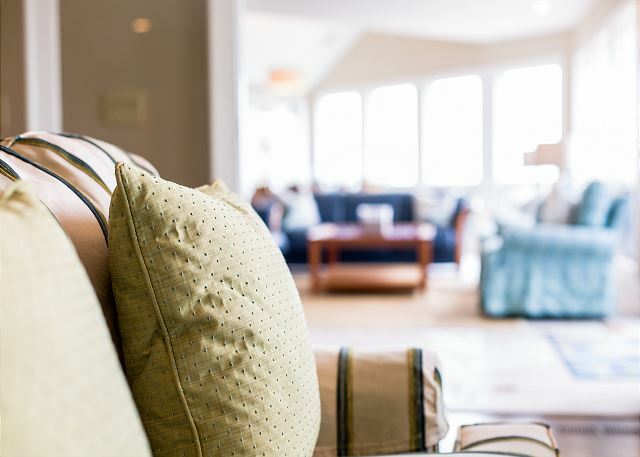 This home is great for mulitple adult couples. 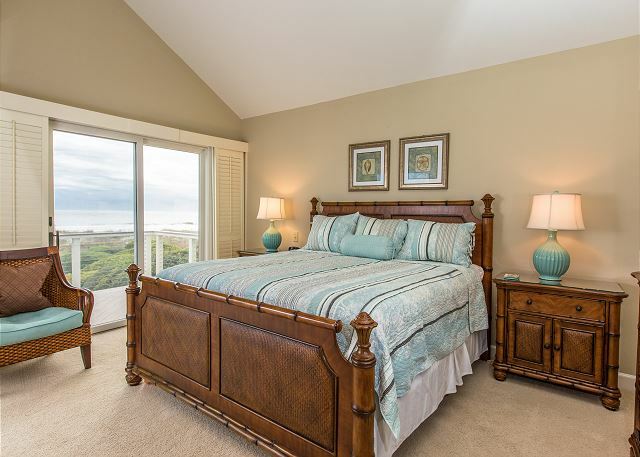 There is a second master suite on the first level with king bed, oceanfront deck access and a large, new bath with custom tile shower and double vanity. The third bedroom features a queen bed, flat screen TV and fully renovated bath with a new tub/shower. The fourth bedroom is on the other side of the main level. This bedroom offers two twin beds and a full bath with new tile shower. 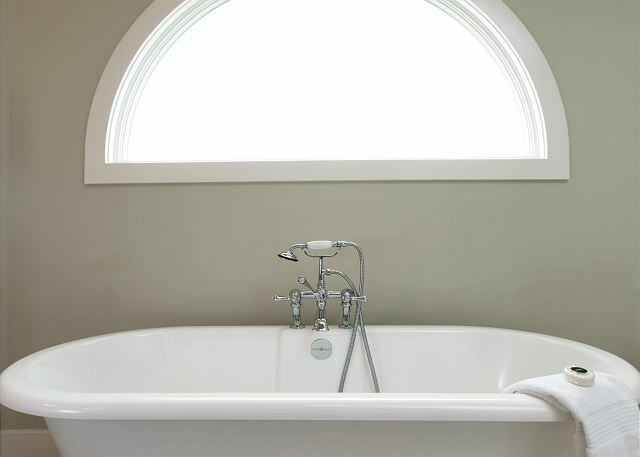 The bath may be accessed from the bedroom directly or from the hall. The formal living area has gleaming hardwood flooring and is tastefully furnished. The den is a fun gathering area with lots of seating, a huge wall mounted flat screen TV and DVD player. 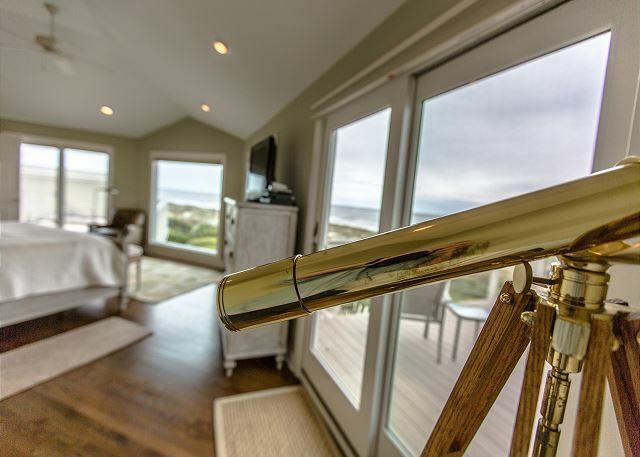 The large picture windows in the den optimize the incredible ocean views! The den opens to the brand new kitchen! Gourmet cooks will delight in the options and equipment available. Prepare delicious meals on the gas range or in the double ovens! 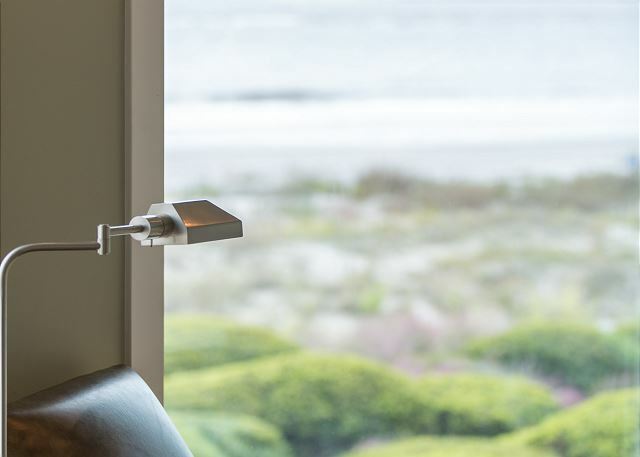 You might be distracted though by the ocean views. The outdoor living space is incredible. The oceanfront deck wraps around the oceanside of the home. There are lots of chairs and a table with umbrella. Below the deck you will find the outdoor shower and gas grill. 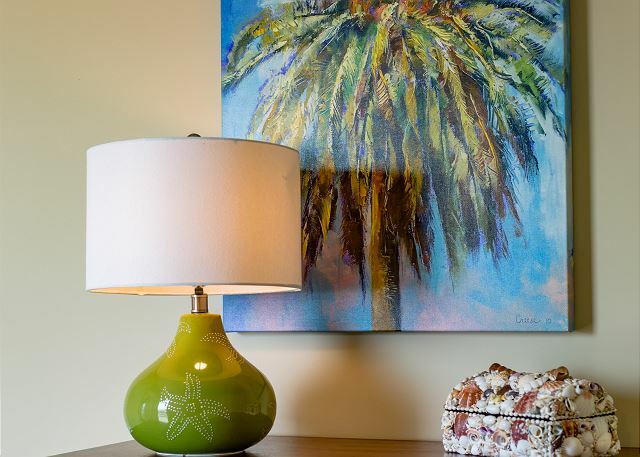 Other home features include WIFI internet, 5 TVs, the best beach access. No land line phone. 5 night minimum during holidays and spring season. 7 night minimum in the summer season. Ample Accommodations, allowing for private spaces, while providing for nice gatherings. Amazing views, with tranquil sounds of the ocean. We had a wonderful vacation and very much enjoyed staying in this beautiful beach home. I think it's the shortest walk to the beach that I've ever had which was really nice with small children. We stayed here with another family and we had four small children with us. The home was impeccably well maintained and spotless. One of the rooms was very warm the first night so we called and the management company handled it promptly and professionally. We had no other issues during our stay. My husband and I stayed in the top floor master bedroom and were able to fit our 18 month old in the closet in a rental crib. The closet even had an air vent inside so it was the coolest, darkest bedroom in the house. He slept very well. We would love to come back to this wonderful place! Enjoyed our visit. 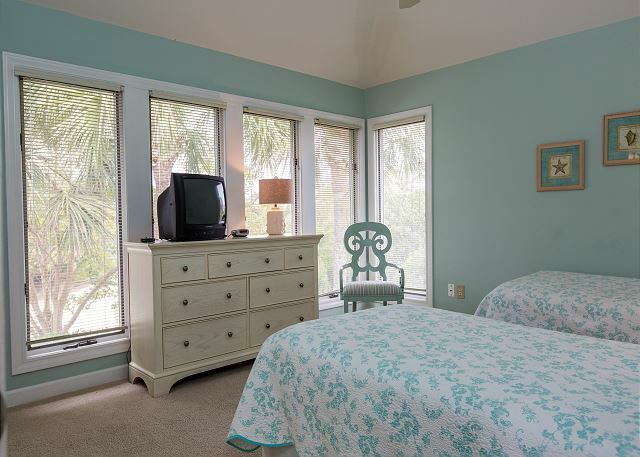 It felt like home...roomy, open, great views, easy access to beach, close to golf. Look forward to our future visits. beautiful home, well taken care of, fantastic location. We had an amazing time. With kids in college the chance to have the family all together was wonderful at this beautiful home. The Ashley/Cantrell had a wonderful time. Nothing beats making Special Memories with your Four Grandchildren and their Parents. Love Seabrook, it is so quiet and beautiful. Pam Harrington Seabrook Exclusives go out of their way to Make everything perfect for you. Beautiful house and beach, very relaxing place to unwind. The outside propane grill is not working. Nicely updated, well maintained and equipped with comfortable furnishings. Kudos to the owners, property management and the HOA! A well-designed and beautifully maintained home in a delightful neighborhood. We are thankful to have been able to spend some quality time here. Our family rented a home on Seabrook island and being on the water was important to us! The house is clean, comfortable, well furnished and has beautiful views! 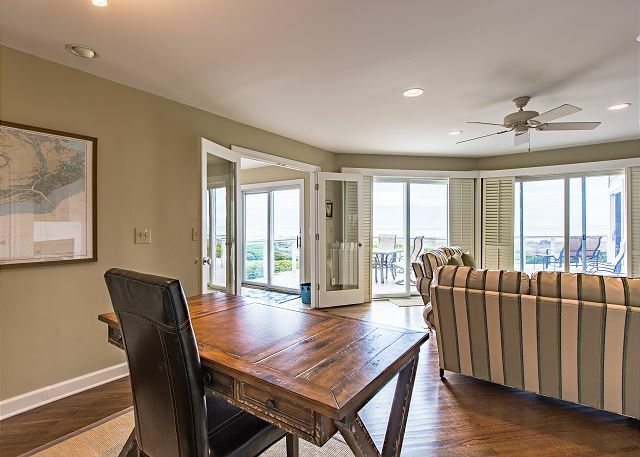 This house sits closer to the beach than its neighbors so from as far to the left and as far to the right as you can see, you are graced with a panoramic view of the beach- Spectacular! They've done a nice job renovating the kitchen and bathrooms and everything was comfortable and well appointed. The upstairs king is over the top!!! You felt like you owned the beach as you viewed it from every place in the house! Will definitely return! Great vacation with the family with beautiful views and literally footsteps to the beach. Likely not a better location on the island. We loved our recent vacation on Seabrook Island and especially the house. The view of the ocean and dunes is exceptionally beautiful. The house is immaculate and inviting. The kitchen is fully equipped for meals at home with top of the line appliances. All the bedrooms were comfortable with beautiful linens. Seabrook Island Exclusives is by far the best resort rental company we have ever rented through. We are looking forward to staying here again next summer. Could not get in at 40'clock because of cleaning. This is an absolutely beautiful home with fabulous views. There are panoramic ocean views and a wonderful deck. It is also one of the most well equipped vacation homes we have ever rented. The beach here is pristine. The island is a great place for bike riding. We also enjoyed golfing and taking a trail ride at the equestrian center. Our Seabrook vacation was a wonderful relaxing escape and an experience I would recommend highly. Beautiful home location is wonderful we will definitely come back! We saw Dolphins every morning and has beautiful panoramic views of the ocean .. deer and other wildlife. Horse back riding bikes and more. The only addition i would make would be to have a company available to set up umbrellas and chairs. that was a pain. but i think this is a rule of the beach. Many Memories were made here. Wonderful beach house to share with my family and grandbabies. Hope to be there next year. Thank you so much. We appreciate you choosing to try Seabrook Island this year over Kiawah Island. 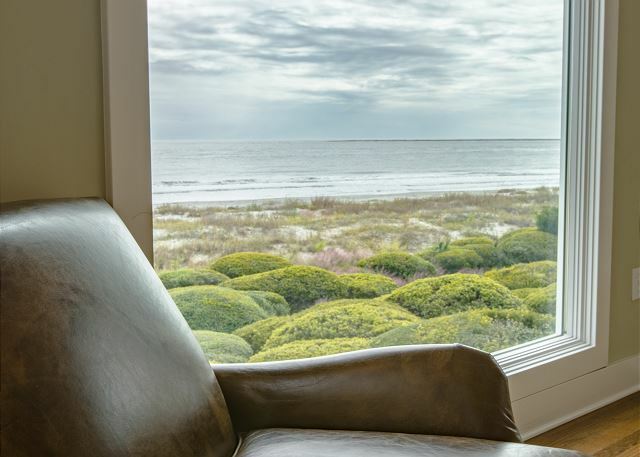 Many of our guests are finding Seabrook Island to be a great alternative to Kiawah Island! We loved our 1 week long stay for a family vacation (7 adults and 1 4 year old). Very spacious!! Great kitchen, great views! 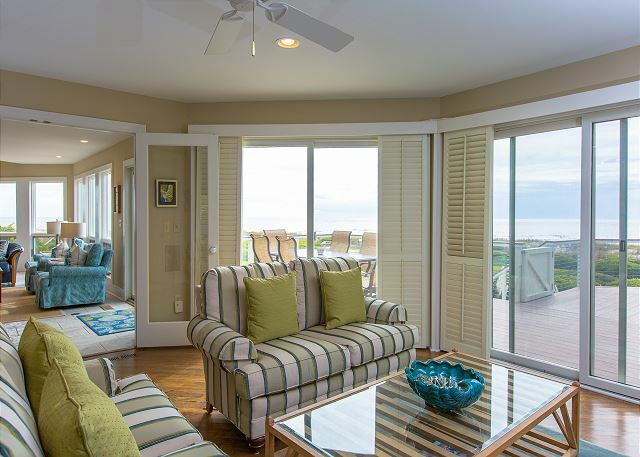 We had a wonderful, long winter weekend at this beautifully remodeled beachfront home! The views are incredible both inside and out! The entire house layout if focused around maximizing the ocean views, and it does this well. Walls of windows in the family room/dining area take full advantage of the scenery. The kitchen is extremely well appointed, with just about everything you can think of at your fingertips. We spent a lot of time on the decks, and used the bbq several evenings. Terrific all the way around. We have stayed at Seabrook Island for the last 3 years, and this is the first place we are planning a return visit to enjoy again. Amazing! House was PERFECT! What a lovely place with an ocean view second to none! The rental staff recommended this house and they were SO RIGHT. Also, the rental staff stocked our fridge so that when we arrived late on Tuesday, we had food AND WINE! We toasted my big birthday that night. It was the perfect beginning to a perfect trip. Thank you so much. It was a great experience and we enjoy very much. The room was double bed the air condition was not working well,and kept the room cooler than what was sep up. The ice maker of the refrigerator was not working well. A Great house with a good location on the beach. We stayed at this great location in 2010 within a month of it being offered. It was great then and has been updated more over the last year. I plan to return next year as well for my third trip. The beach is a short walk from the porch and there is plenty of it. In my long walks along the beach, this house has some of the best beach front on that entire part of the island. The beach club is close enough to walk to and they have the traditional pool and poolside food if the kids desire. A great stay overall. Thanks so much for coming back to see us again this summer! This home is going to become a 4 bedroom 4 bath home for next year! The upstairs loft will become a master suite. It's going to be even more fabulous. The view from the decks are fantastic. The design of the home was perfect. great views of the beach! 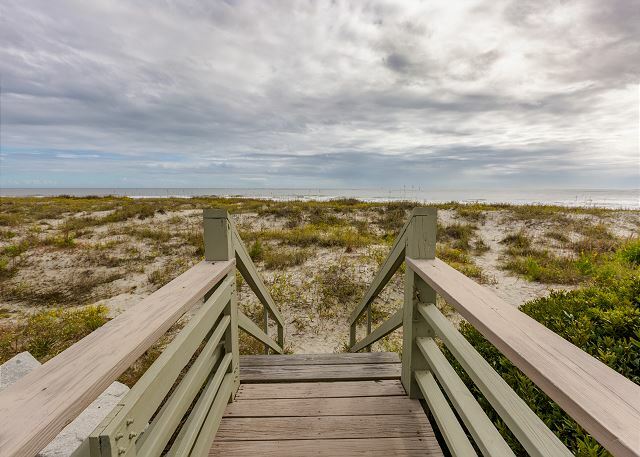 The perfect location for Seabrook Island. Our only negative was that the appliances need updating. The oven's dial was unreadable, which made it difficult to bake anything. The fridge and dishwasher are also quite old. thanks for your stay! The refrigerator is only one year old. The kitchen is going to be completely renovated this fall and the other appliances will be updated. . This home will become a 4 bedroom property for 2012 season.